A delightfully small and well proportioned four glass mantel clock. The 8 day duration single fusee movement of substantial quality with four tapered plate pillars and anchor escapement. Also with a finely made pendulum and transportation fixing point. The 3½” square silvered brass dial framed within a silvered brass square and with Roman chapters, blued steel hands and engraving to the four corners. The small oak case of typical four glass design with an ogee moulding. The top, sides, front elevation and rear door all with bevelled glass. Note: Small four glass mantel clocks from the 19th century are now becoming increasingly difficult to find. This is an unusual example as the chosen cabinet material is oak. An Excellent Mid 18th Century Ebonised Table/Bracket Clock by John Dowson – London. 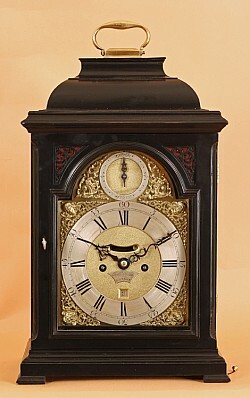 An excellent mid 18th century ebonised table/bracket clock. The 8 day duration five pillar double fusee movement with verge escapement and striking and repeating the hour on a bell. The backplate engraved with scrolls, foliage, flowers and a central engraving of a basket of fruit. The dial with a silvered brass chapter ring, blued steel hands, date square above number VI, mock pendulum aperture, brass corner spandrels and the centre of the dial displaying a cartouche with the makers name and place of work. The arch also with Strike/Silent facility and further spandrels. The very plain fruitwood veneered case with ebonised finish and carrying handle to the inverted bell top. The sides of the case with inspection windows, sound frets to both front and back and standing on four ebonised feet. Note: John Dowson is listed as working in both London and Bath. It appears he served his apprenticeship in London and then later moved to Bath. He continued to do business in both cities throughout the 18th century. New to the showroom this week we have a very finely made and elegant longcase clock by the eminent maker Thomas Reid of Edinburgh. Please see below for image and the full description. Clicking through to the website will allow you to view larger images and listen to an audio file which will be uploaded shortly. Several longcase clocks will be arriving back from restoration in the next few weeks which feature moonphase and regulator quality movements. All will be photographed and uploaded to the website ASAP. A rare late 18th century Domestic Regulator by this famous maker. The 8 day duration high quality movement striking the hours on a bell and with Deadbeat Escapement and Harrison Maintaining Power. The round silvered brass dial showing seconds, date, Roman numerals, matching blued steel hands, and the makers name and place of work engraved across the centre of the dial. The silvered dial framed within a brass bezel. The movement complete with its original brass cased weights and substantial wood rod pendulum with large brass bob. The plain but very elegant mahogany cabinet work with the rare use of Pommele mahogany to the trunk door and throughout the rest of the case. The plain base features original bracket feet and a small raised moulding to the main panel. The broken arch pediment with a central finial stand terminating with a gilt ball finial. An extremely elegant example of a late 18th century Scottish Longcase Clock. Note: Thomas Reid is listed as an eminent maker and was apprenticed to James Cowan on 9th October 1762. For 11 years he lived in London where he appears to have worked for and observed the work of several Master Clockmakers. In 1788 he designed and built the first clock for the spire of St Andrews Parish Church, George Street, Edinburgh. In 1806 he welcomed William Auld into partnership which was the beginning of a long and prosperous business. They specialised in unusual Regulators including Astronomical and long duration. Just back from restoration we have a delightful little clock made in London in the first half of the 19th century. This type of Clock is sometimes called a Library Clock as they were very often used in a Library for accurate timekeeping but without the constant striking of a bell or gong. Please click here for further details and larger images. There is also a short audio file available. 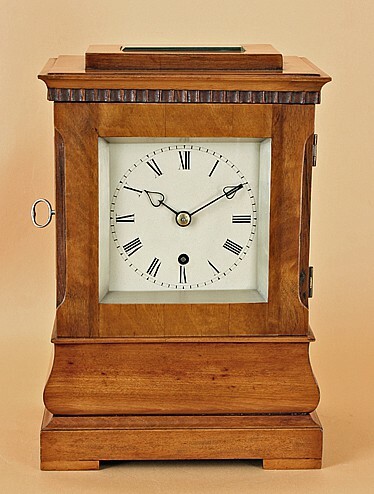 An exceptional English Single Fusee mantel clock of small size and with rare Satinwood cabinet work. The 8 day duration single fusee movement of substantial quality with four tapered plate pillars and anchor escapement. Also with finely made pendulum and transportation fixing point. The 4″ square painted dial framed with a silvered brass square and with Roman chapters and matching blued steel hands of exquisite quality and design as used by the well known makers Payne of London. The small and very well proportioned four glass satinwood case with ogee moulding, four block feet and unusual rosewood veneered canted corners. The top and sides of the case with rectangular bevelled inspection points. 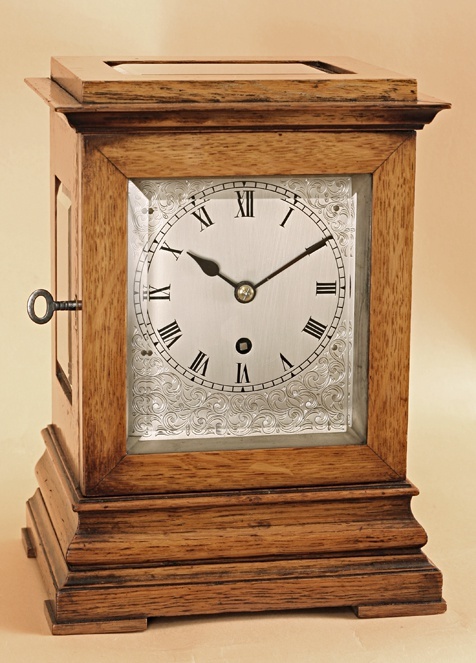 Note: Very few small mantel clocks from this period exist and even fewer are made using Satinwood. This particular example is anonymous but its very likely that it did once have a retailers name on the dial and would have been made by one of the fine makers of the time, perhaps based in Clerkenwell. A rare example. Another bracket clock by Webster of London of unusual form and featuring a carved thistle.